If you’ve lost one or more consecutive teeth, Dr. Thomas Dolan and Dr. Brendan Dolan may recommend a new dental bridge as the optimal solution. 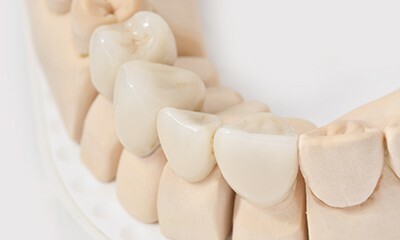 Bridges are designed to literally “bridge” the gap within your smile, restoring full function and helping to prevent remaining natural teeth from shifting out of position over time. Give our team a call today here in Wethersfield, CT if you’re ready to pursue a worthwhile tooth replacement! After the new bridge is in place, it’s likely going to take some time for patients to become accustomed to the new sensation. Within a few days, though, they should feel just like your regular teeth! Our team recommends that patients stick to a soft food diet early on in order to minimize any discomfort. Over time, missing teeth can start to negatively affect your oral health, your smile’s ability to function, and your quality of life – so don’t wait! Start talking to our dental team about tooth replacement options like dental bridges today. We’re happy to help, and new patients from Canton, CT and other surrounding areas are always welcome.